Displaying temporary signage at an event or reception requires convenience and ease of use. 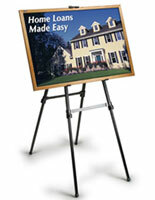 Portable easels provide the solution for presenting images. 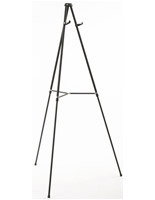 Use our floor stands for welcoming guests to a wedding, help with wayfinding at a trade show, even for supporting drawing pads for artists. 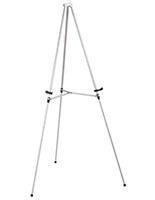 Foldable portable easels are lightweight, collapsible, and affordable — the three most important features customers look for. Many models come with their own carrying bag and set up instantly. Event organizers and planners know the advantages of a dependable product when they see one. 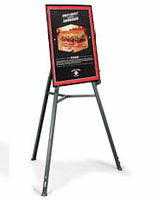 With our selection of folding portable easels, you'll get incredible value with the ability to promote targeted signage and displays. 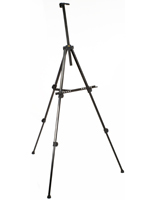 What kinds of compact tripods do we carry? 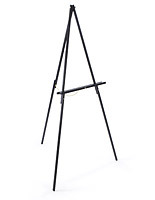 Shock Cord —folding portable easels that assemble just like a tent frame are some of our most affordable styles. 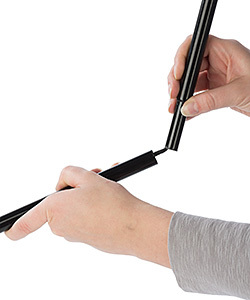 Aluminum poles come with elastic bungee cords threaded inside for fast assembly and disassembly. 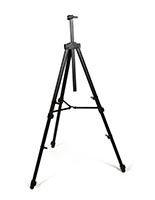 Even when the metal sections are separated, the entire tripod stays together for convenience. Due to their lightweight design, shock cord stands can only support a few pounds. This makes them excellent candidates for displaying signs, poster frames, and canvases. 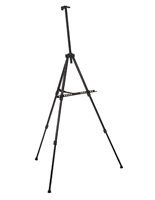 Telescoping — easily the most common design, foldable easels featuring telescoping tubes are standards of the industry. One of their greatest advantages is their adjustability. 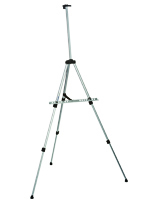 Since each leg is independently extended and adjusted, the metal tripods can be leveled over irregular terrain. 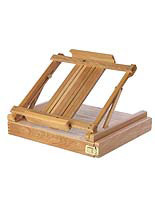 Some collapsible stands even collapse far enough to be used on tables or countertops. They also have the ability to support much more weight than the shock cord styles. 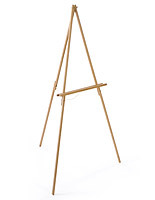 Retractable — these folding easels are manufactured from wood. Not only are they suitable for artwork display, they're also used by artists out in the field. Their collapsing action is controlled by the turn of a thumbscrew. 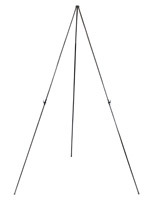 The legs retract in a way similar to the telescoping models. 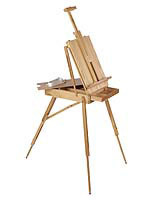 Our outdoor plein air easel, for example, holds pads and canvases while providing ample storage space for supplies. 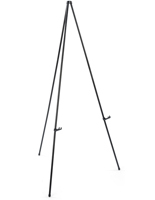 Since the majority of the above applications are for displaying signs and graphics, tripod stands paired with picture frames offer cost-effective solutions. This provides one-stop-shopping if you plan to showcase standard format posters. Whether for a wedding reception or a business seminar, we understand events change on a daily basis. That is why we paired front-load poster frames with an easel. Changing a graphic is a simple proposition thanks to snap-open technology. Simply flip up each of the four sides to access the frame!